N. Vajragupta, S. Ahmed, M. Boeff, A. Ma, A. Hartmaier. Schematic diagram for the micromechanical modeling approach to derive an advanced initial yield surface. In order to describe irreversible deformation during metal forming processes, the yield surface is one of the most important criteria. 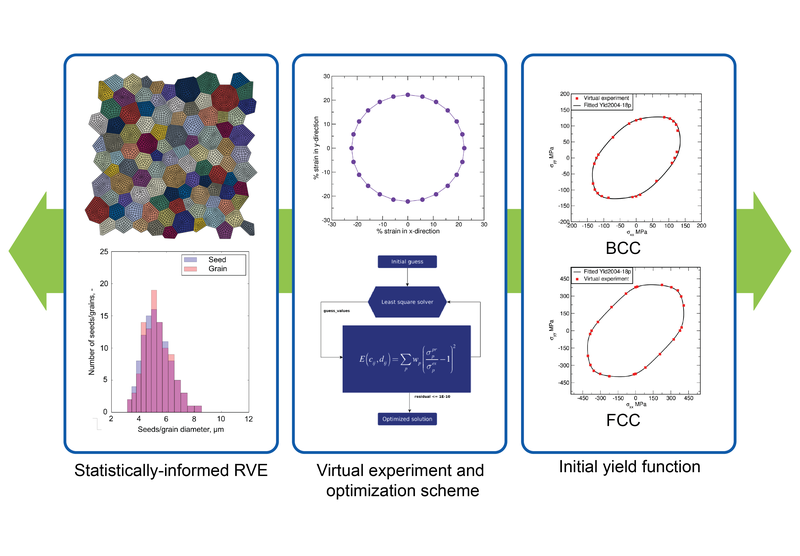 Because of their simplicity and efficiency, analytical yield functions along with experimental guidelines for parameterization become increasingly important for engineering applications. However, the relationship between most of these models and microstructural features are still limited. Hence, we propose to use micromechanical modeling, which considers important microstructural features, as a part of the solution to this missing link. This study aims at the development of a micromechanical modeling strategy to calibrate material parameters for the advanced analytical initial yield function Barlat YLD 2004-18p. To accom- plish this, the representative volume element is firstly created based on a method making use of the statistical description of microstructure morphology as input parameter. Such method couples particle simulations to radical Voronoi tessellations to generate realistic virtual microstructures as representative volume elements. Afterwards, a nonlocal crystal plasticity model is applied to describe the plastic deformation of the representa- tive volume element by crystal plasticity finite element simulation. Subsequently, an algorithm to construct the yield surface based on the crystal plasticity finite element simulation is developed. The primary objectives of this proposed algorithm are to automatically capture and extract the yield loci under various loading conditions. Finally, a nonlinear least square optimization is applied to determine the material parameters of Barlat YLD 2004-18p initial yield function of representative volume element, mimicking generic properties of bcc and fcc steels from the numerical simulations.